Your Carlsbad cosmetic and general dentist. La Costa Dental Excellence is committed to delivering state-of-the-art treatment with your comfort in mind. 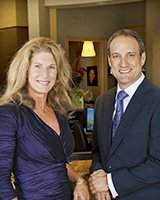 Our dentists, Dr. Stephen Dankworth and Dr. Kimberly Corrigan-Dankworth, put their extensive technical skills and artistry to work for the benefit of each of their patients. Whether you seek general dentistry, dental treatments with sedation, or dental implant placement, our cosmetic dentistry practice in Carlsbad, California can provide you with a healthy, attractive smile. When you enter our practice, our friendly staff and relaxing office atmosphere will immediately put you at ease. Music and a calming waterfall will greet you when you enter our practice. Our dentists will discuss your dental care with you in a private consultation room. To make you more comfortable during treatment, we offer warm blankets, special chair pads, and sedation upon request. We invite you to visit La Costa Dental Excellence in Carlsbad to experience our committed approach to your dental care. If you live or work in the Encinitas, San Marcos and Carlsbad area, call us today at 760-633-3033. You don’t need to take a trip to Hollywood to create that superstar smile. La Costa Dental Excellence offers all the cosmetic dentistry services you need to give you a picture perfect smile that you can’t help but show off. Call us to see what cosmetic dentistry services will best enhance your smile. Dental Implants have truly revolutionized dentistry. Dental implants provide a phenomenal foundation on which partial or full dentures and dental crowns can be placed. La Costa Dental Excellence utilizes the finest materials and procedures when placing dental implants. For many people, visiting the dentist evokes intense anxiety and fear. La Costa Dental Excellence has invested in sedation dentistry, which makes it possible for someone with even the most intense dental phobia to feel relaxed and calm during their visits—enabling them to receive needed top-quality dental care.